sisu: "If you weren’t bright enough to do science, you could go into politics"
"If you weren’t bright enough to do science, you could go into politics"
Which one doesn't fit? 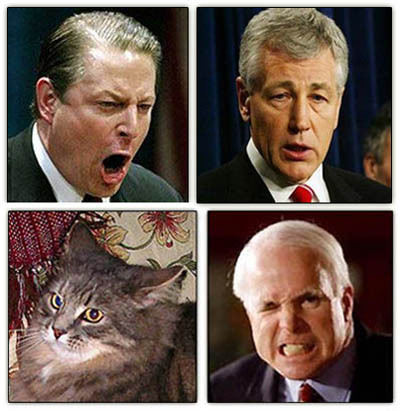 Al Gore, Chuck Hagel, top, Baby Cakes and John McCain bottom. Clue: You can't herd cats. I was also raised in a scientific tradition that regarded politics as inferior: If you weren’t bright enough to do science, you could go into politics. I retain that prejudice today. I also come from an older and tougher tradition that regards science as the business of testing theories with measured data from the outside world. Untestable hypotheses are not science but rather something else. Yes, you, Al Gore, and you, Chuck Hagel, and you, John McCain, whose ascientific gaseous emissions re the "sky is falling" scenario on anthropogenic global warming climate change -- just like his phony "let's get the money out of politics," incumbent-protection campaign "finance reform" law, which YouTube and the internet are fortunately leaving in the dust -- make our blood boil. We must say we were disappointed to read this very day that the otherwise sensible Rudolph Giuliani has thrown in the towel re climate change as well. 'Hope our own personal favorite, Fred Thompson -- who just the other day disavowed his earlier foolish support of McCain/Feingold -- doesn't have any Chicken-Little tendencies. Don't these people realize some of us potential supporters out here read and study the "heretics" and "deniers" who are challenging scientific "consensus"? Not to mention our understanding that tax cuts -- by stimulating the economy -- increase tax revenues? Sigh. In the current political climate -- probably it was always thus -- truthiness trumps truth. "Meet John Doe" with Gary Cooper and "Mr. Smith Goes to Washington" with James Stuart represent the Greatest Generation which existed in my youth. Unfortunately the incompetents of the current generation are well represeneted in our current politicians and media. Let us hope that the John Does as pictured by Michelle Maulkin and the Mr. Smiths can rise in their inate wisdom and lead us to the strength to overcome the sloth of those who deny the dangers of the real world. I am getting sick of ALL of them. Rudy's stance doesn't surprise me. He's tough on crime (and maybe even has a good defense ethic) but he's a social liberal. In the end it comes down to which candidate is going to have the most issues in accordance with your views. But in the meantime, watching all the pols scramble after the "global warming" vote is weirdly amusing. Baby for President. Sissy for vice president. After all, SHE has opposable thumbs!